Last week had an opportunity to stay and spend time at Ideal Beach Resort, Mahabalipuram. Beautiful Resort, Superb Service and the stay was memorable.. Thanks to the courteous staff for making this stay a memorable one.. Sure to go back there again someday.. The below photos are of "The Grand Canyon"@ Mahabalipuram.. Thanks to my friend Yathindhar for giving this idea. We hit the beach at around 6 am to get the Sun, Sand and the Sea. This blog is about the"The Great Canyons" of Mahabalipuram. This photo is special to me as it is me @work capturing "The Grand Canyon" and is a candid shoot of mine taken by Yathin. 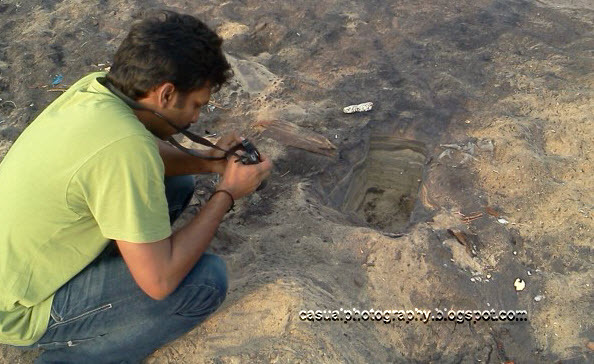 Hope now you are of the subjects in the above photographs..Yes the hole in front of me is the "SUBJECT"..